BS 8599-1 Workplace First Aid Kits to meet the enhanced standard for first aid at work suggested by the British Standards Institution. 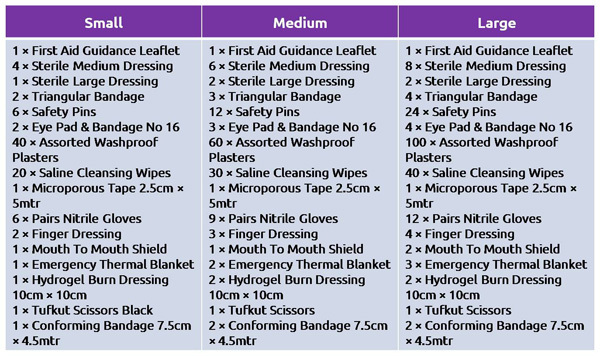 These kits contain a more comprehensive range of first aid equipment than normal workplace kits and better reflect real-world first aid needs. The kits are supplied in a robust, wipe-clean plastic box and include a wall bracket. This kit is available in three sizes - small, medium and large. You should select the appropriate size based on your own risk assesment, but in low hazard environments a guideline might be one small kit for up to 25 people, a medium kit for up to 100 people, and one large kit per 100 people thereafter. High hazard environments may require at least 1 large kit per 25 people.